The 0-3 month motor milestones video shows parents and caregivers 5 examples of motor milestones baby should reach by 3 months old. Each video clip shows how baby should be moving and what parents and caregivers should watch for. Early motor delays can be detected by 3 months of age and the motor milestones video series can help parents and caregivers to track their baby’s development and detect possible delays. Find games to help your child reach these milestones and more based on their date of birth. The first 3 months of a baby’s life are a critical time for growth and development. 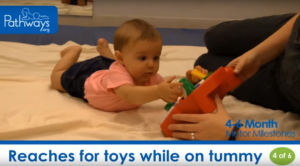 Infants begin to learn how to move their bodies and interact with others. Some of baby’s key motor milestones at 3 months include using Tummy Time. Practicing Tummy Time daily will help babies meet milestones by building their core strength and allowing them to explore their environment. Watch how you can overcome Tummy Time Troubles here. Use Pathways.org resources to track baby’s milestones and help identify potential early motor delays. If you notice your baby is not meeting their 0-3 months motor milestones, talk to their health care provider. As your baby reaches these 0-3 month motor milestones, take a look at our 4-6 month motor milestones to see what to work towards next. At 0-3 months there are sensory milestones your baby should be reaching too. Watch to see what they look like. Watch typical and atypical development at 2 months in eight different positions.